CAMERON, WI - There has been a buzzing sound in the small town of Cameron, WI for almost two decades now, and it’s been coming from Buzz Signs and Graphics, where some of the sharpest race cars in the country have been designed. Kevin “Buzzy” Adams, son of prominent engine builder Dave Adams of Adams Automotive, has made a significant mark in WISSOTA auto racing competition over the past several years. 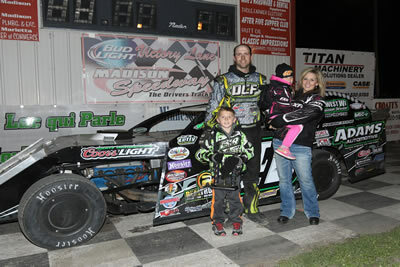 He has won eight WISSOTA 100 features (two in a Midwest Modified, two in a Street Stock and four in a Modified. Also, a five-time WISSOTA national champion in the Super Stocks (2003) and Modifieds (2008, 2011, 2014, 2015), Adams has racked up numerous track championships and over 400 feature wins since his career began. There is no doubt nearly everyone who races in WISSOTA knows Buzzy Adams. After being employed by Gaber Signs for two years, Adams decided in 2001 he had enough experience with graphic computer software and vinyl application to go solo. Today he runs Buzz Signs and Graphics from his 50ft x 50ft race car shop, which is just a stone’s throw from the family’s engine shop. To date Adams has lettered well over 1,000 eye-catching race cars from Canada, Montana, Wyoming, South Dakota, Kentucky, Michigan, Minnesota, Wisconsin and even Florida. The company also boasts more than 100 Best Appearing Car awards in 15 years stretching from Wyoming to Wisconsin. Drivers from coast-to-coast have utilized Buzz Signs & Graphics over the past several years. For those “do it yourself” types, Adams will gladly design, cut and mail the graphics to you like he’s previously done for several Montana and Wyoming weekend warriors. “I have a measurement sheet, and a sponsor sheet that I can email to the customer, then they can send it back to me to ensure the wraps will fit perfectly,” he said. 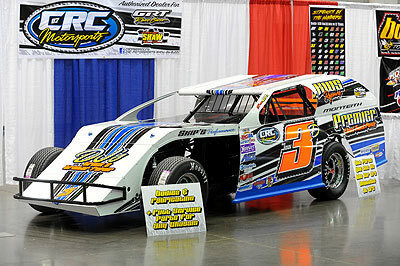 Buzz Signs and Graphics is not limited to race car graphic applications, however. Adams will stick vinyl to nearly anything from go-karts and snowmobiles to banners and trailers; no matter how large or small the job, Adams can handle it. “I really feel one of the reasons that customers keep coming back is that my prices never change. You can always get the best looking job from me for under $600. “Only a racer knows what a racer wants. Since I’m a racer and know what I want my car to look like on the track, I have a good idea what other racers want too,” Adams added. “We are not the cheapest, but not the most expensive. You get what you pay for here. Customers are always impressed with how simple our pricing system is! Sharp looking race cars attract more sponsor opportunity. Adams can be reached by telephone at (715) 458-4549, by logging on to www.buzzsigns.com or e-mailing him at BuzzSigns@chibardun.net. You can also stop in at his shop located at 409 W. Poplar Ave. in Cameron, WI, 54822. Call now to hear what the “Buzz” is all about!